Vice President Joe Biden has decided to forgo a 2016 presidential bid, he announced Wednesday. 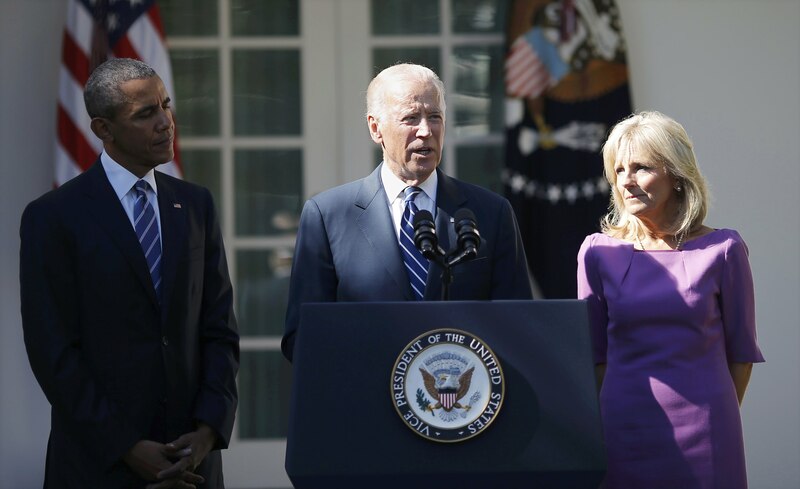 "I believe we're out of time -- the time necessary to mount a winning campaign," the vice president said from the White House Rose Garden with his wife Jill Biden and President Obama by his side. The decision ends months of speculation about whether Biden would step up to challenge Hillary Clinton, the current front runner for the Democratic nomination and his former Obama administration colleague. The vice president took his time to consider whether he and his family had the "emotional energy" to endure another campaign, following the tragic death over the summer of his 46-year-old son Beau. "As my family and I have worked through the grieving process, I've said all along -- what I've said time and again to others -- that it may very well be that process, by the time we get through it, closes the window on mounting a realistic campaign for president - that it might close," Biden said Wednesday. While his fellow Democrats gave him his space, pressure mounted for Biden to come to a decision as Democratic voters, party operatives and deep-pocketed donors considered which candidate to line up behind. Biden was also running up against logistical deadlines: The first filing deadline for appearing on a 2016 primary ballot is November 6 in Alabama. Additionally, the Democratic primary debates are already underway; CBS News hosts the next Democratic debate on November 14 in Iowa. The vice president insisted Wednesday that "there is no timetable" for the process of running for president. "The process doesn't respect or much care about things like filing deadlines, or debates and primaries and caucuses," he said. Moreover, the vice president said he and his family have reached a turning point in their grieving process. Even so, he said he still believes he is out of time. "While I will not be a candidate, I will not be silent," Biden continued. "I intend to speak out clearly and forcefully, to influence as much as I can where we stand as a party and where we need to go as a nation." The vice president said the Democratic Party and the nation would "be making a tragic mistake" if they were to walk away from or attempt to undo the Obama legacy. "Democrats should not only defend this record and protect this record, they should run on the record," he said. "We've got a lot of work to get done over the next 15 months... but let me be clear that we'll be building on a really solid foundation." Biden stressed the significance of issues that are central to the Democratic Party platform, such as the need to address income inequality and pursue campaign finance reform. "I believe the huge sums of unlimited and often secret money pouring into our politics is a fundamental threat to our democracy...the middle class will never have a fighting chance in this country as long as just several families, the wealthiest families, control the process," he said. The vice president also declared, "I believe we need a moon shot in this country to cure cancer." While acknowledging the issue is personal for him, after his son's battle with brain cancer, Biden noted that the administration has increased funding for cancer research and development. "I'm going to spend the next 15 months in this office pushing as hard as I can to accomplish this because I know there are Democrats and Republicans on the Hill who share our passion, our passion to silence this deadly disease," he said. "If I could be anything, I would have wanted to be the president that ended cancer because it's possible." While Clinton has dominated the race for the Democratic nomination, there's clearly at least some thirst among Democrats for an alternative. Bernie Sanders, the socialist senator from Vermont, has drawn huge crowds to his campaign events, and he has stayed competitive with Clinton in polls in key states, as well as in terms of fundraising. All the while, Biden had maintained a base of support. Polls throughout the year showed that Biden consistently won the support of at least 10 percent of Democrats nationally and in early-nominating states. Biden's decision is good news for Clinton, though she hardly has a lock on the nomination. As her Democratic opponents work to keep her on her feet, Clinton will also have to fend off attacks from Republicans scrutinizing her use of a private email account and server, as well as her actions ahead of the September 12, 2012 Benghazi attack.